I'm not generally someone who can put an outfit together first thing in the morning. I can barely get myself out of bed and organised for work, never mind have decision making capabilities. As such, I always choose my next day work outfit the night before. 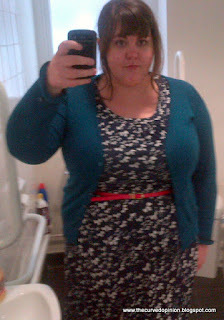 Here's what I wore today, together with the snap I took of the outfit that last. The dress and the cardigan are from Dorothy Perkins, the belt is from Asos Curve. How do you plan your outfits? My post today is the outfit I have as a "go to", considering I forgot to plan one last night!